Recent events in Flint, Michigan led to many local and state agencies, as well as schools and businesses to investigate their water systems. Lead has been found in some communities and officials are tackling those issues. Although water fountains are typically disinfected and well maintained by cleaning staff, the lead in those types of water systems can’t be easily washed away. It’s important to understand how you can find out if you water supply is lead and contaminant free. The EPA requires a yearly report for all community water systems accessible to residents in the community. Referred to as the Consumer Confidence Report (CCR), the report is published by July of each year and can be found by contacting your local community water supplier. If there are issues with the community water, the EPA requires the water supplier to alert residents within the community. If your water is sourced from a private well, it can also contain lead. Although boiling the water can eliminate some contaminants, it doesn’t eliminate lead. It can actually increase the amount of lead in the water because water evaporates while it’s boiling. Each state’s State Certification Officer can provide a list of certified laboratories to test your well water for a fee to check for lead. Another cost effective way to remove lead from well water is to flush the system. Ensure all faucets are not used for approximately 6 hours. First thing in the morning may be a good time to flush the system. Allow cold water to run out of each faucet for approximately 1 to 2 minutes. Flush each faucet one at a time to ensure the water pressure is as high as possible and the well pump pulls more water out of the well each time. You can recycle the flushed water by using it for other purposes such as washing dishes or clothes and watering indoor and outdoor plants. Many homes and offices use bottled water, large, filtered water systems or water coolers for drinking water to avoid the stigma of bad tap water. Most community water systems provide safe water and some communities add fluoride to its water to assist with dental care, while some tap water is very hard, causing lime scale build-up. Although bottled and filtered water typically have a neutral pH after being filtered, the equipment used to store it can contain other sources of potential health hazards if it’s not properly maintained. All water and wet surfaces can create biofilm, which can carry human pathogens, and other harmful bacteria that grows on a variety of surfaces. It presents itself as a slimy layer often found in sinks, bathtubs and drainage systems. It can also collect in water dispensing systems, such as water coolers. For that reason, even water filtration systems and any other containers used to carry water must be cleaned. Many people refill water bottles from water coolers to avoid waste and additional costs to continue replacing the bottle. Although you can use that method a few times, it should be washed thoroughly each time. In many cases, you’re wasting a lot of water simply by cleaning them out. A better solution is to simply by a water container that can be washed like any other dish with soap and water. 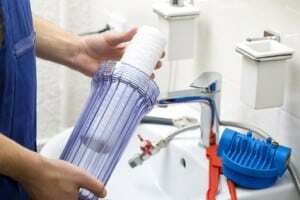 For those who use water filters in their water systems or tap water faucets, the filters must be replaced as suggested by the manufacturer. If the filtered water is held in a pitcher, the pitcher should be cleaned frequently. Water coolers should be drained and flushed on a routine basis to avoid a biofilm forming. It can be flushed with filtered, boiling water. If the water cooler has a heating element, do not drain the hot water, as emptying the hot water may make the heating element malfunction if it’s dry for too long. Allow the water to dwell in the tank to kill all of the bacteria, then drain it completely. A disinfectant can be used first. Because each water cooler is designed differently. Some water cooler distributors may suggest using a lint free cloth and disassembling the inside of the cooler to properly clean it. In general, boiling water, allowing it to dwell and draining the system should kill any bacteria in the system. Mold can collect in almost any moist environment, including the types of water dispensing systems mentioned. Mold spores are microscopic and go undetected for a long time. Even if your water dispensing systems don’t contain lead, ensure you properly maintain them to avoid mold and its spores. Our immune systems can tackle some harmful bacteria, but not everyone’s immune system is perfect. It’s important to keep water supplies clean, especially in environments used by the general public. Staying abreast of how to test and maintain water supplies, using the appropriate cleaning products and supplies and caring for those systems can assist in avoiding any potential health issues. This entry was posted in Dishwashing, Disinfectants, Drain & Septic Maintenance, Safety and tagged Disinfectants. Bookmark the permalink.